Is Israel’s Assault on Gaza a Response to Hamas Rockets? Would Cessation of Rockets from Gaza Stop the Atrocities? Israel states that its current use of force against Gaza, one of the most densely populated areas in the world, with approximately 1.8 million inhabitants, with the world’s 13th highest population growth rate, a crippling economic situation with 22.5% unemployment (ranked 170th in the world), where 38% of the population lives below the poverty line, who’s means of defending itself are extremely limited and altogether dwarfed by the formidable size and strength of the Israel Defense Forces, is a necessary action needed to protect itself. Gaza is often described as an “open air prison,” this assessment is in many ways accurate; in addition to the ongoing economic blockade, Israel and Egypt have closed the borders on either side preventing the people of Gaza from leaving. Israel controls the borders around Gaza and the waters that surround it. Only the injured, sick and those with foreign passports are allowed to leave, “Gaza is unique in the annals of modern warfare in being a conflict zone with a fence around it, so civilians have no place to flee,” said Chris Gunness, spokesman for the U.N relief agency for Palestinian refugees; the people of Gaza are trapped. In contrast Israel has one of the world’s most advanced military systems, provided to them through aid from the world’s largest military superpower and through contracts from the world’s wealthiest weapons manufacturers here in the United States. In the 2014 fiscal year the US gave Israel $3.1 billion in aid, and according to the official Congressional Research Service Report for Congress, “Almost all U.S. bilateral aid to Israel is in the form of military assistance.” Hamas, on the other hand, is estimated to have a total budget of only $70 million, with much of that sum being devoted to an extensive social services network that funds schools, orphanages, mosques, health clinics, soup kitchens, sports leagues, and more, leaving very little room for defense spending. “Approximately 90 percent of its [Hamas’] work is in social, welfare, cultural, and educational activities,” writes Israeli scholar Reuven Paz. Despite these asymmetries, Israel maintains that its current, forceful use of its awesome military might against a literally trapped, militarily primitive, and economically crippled Gaza population is necessary for Israeli security. These justifications are parroted by the United States government, Secretary Kerry stated in an interview with NBC recently that, “Israel has been under attack by rockets. I don’t think any nation in the world would sit there while rockets are bombarding it,” the White House also issued a statement immediately following Israel’s commencement of Operation Protective Edge stating, “We strongly condemn the continuing rocket fire inside of Israel and the deliberate targeting of civilians by terrorist organizations in Gaza. No country can accept rocket fire aimed at civilians and we support Israel’s right to defend itself against these vicious attacks,” and President Obama wrote recently, “As I’ve said time and again, neither I nor the United States will ever waver in our commitment to the security of Israel and the Israeli people. A few elementary questions need to be answered to assess the validity of these statements: Is this current military operation and aerial bombing campaign a result of Hamas rocketing Israel? And further, would the cessation of Hamas rockets be sufficient to halt the current Israeli attacks? Is Israel’s current military assault on Gaza a result of Hamas rocket attacks on Israel? This narrative, although useful for Israel and its apologists, is entirely false and doesn’t stand up to even the most cursory level of scrutiny. The current escalations of conflict did not begin with Hamas attacks against Israel, quite the contrary. The escalations are instead widely believed to have started with the abduction of 3 Israeli teenagers from settlements in the West Bank on 12 June 2014, of which Prime Minister Netanyahu immediately blamed on Hamas. No evidence for this existed whatsoever, and Netanyahu knew it, but before that is explored it is perhaps pertinent to bring up something that is authoritatively known and proven to have occurred in relation to youth atrocities in relation to the Israel-Palestine conflict. Much is heard about the injustice and horror of the 3 Israeli youths, and rightly so, however barely a peep has been uttered in relation to the fact that just a few weeks prior on May 15th, the Israel Defense Forces shot and killed 2 Palestinian youths. One, Nadeem Siam Nawara, was 17, the other, Mohammad Mohmoud Odeh, was only 16 years old. As irrefutable video evidence shows, these youths posed no threat whatsoever, not even throwing rocks or stones at the time of their murders, and were actually retreating and moving backward when their lives were taken from them. In this case it is known emphatically that Israeli government forces were behind the indiscriminate killings, so therefore should Hamas be justified in raiding through the homes and villages of Tel Aviv and Jerusalem, kidnapping and detaining scores of innocent Israeli citizens, while murdering them as well because the IDF shot and killed these 2 innocent teenagers? No, of course not, but then why should it be any different for Israel? Despite the fact that no evidence whatsoever existed connecting the abduction of the 3 Israeli settlers to Hamas, the Netanyahu government launched an altogether illegal military invasion and attack on Palestine on June 12th, dubbed “Operation Brother’s Keeper.” The stated goal was focused on, “bringing our boys who were abducted, home,” and, “operating against Hamas.” What followed was a widespread 18-day military assault on the population in the West Bank in which thousands of soldiers, together with security agents, police, and special forces scoured through Palestinian towns, refugee camps, and villages, invading thousands of innocent Palestinian homes at the barrel of a gun, stealing upwards of $3 million dollars USD from these victims, arresting and detaining between 550-800 West Bank residents without charge, and murdering at least 6-10 innocent civilians who had absolutely nothing to do with the abduction of the Israeli settlers. this makes Israel guilty on all counts of atrocity and war crime, as they not only raided and terrorized the population, they as well stole their property and currency as well. What makes Israel’s act of aggression even more egregious and illegal is the fact that its pretext was a total fabrication; Israel knew within hours after the abduction of the 3 Israeli youths that they had been killed, however they put a gag order on this information, barred the newspapers from reporting it, even lied to the parents by telling them their sons were still alive when they knew that they weren’t, and used this false pretext as an excuse to carry out what they referred to as a search and rescue mission to find the lost teenagers, justifying all of their incredible crimes against humanity and indisputable war crimes under the pretext of attempting to find the kidnappers of the 3 Israeli teenagers, of whom they already knew were dead. Israel has engaged in a cover-up of what they knew to be a murder by saying that the abductees were still alive, all in order to wage a war of aggression against the occupied, economically crippled, and oppressed Palestinian population. “Israeli police, intelligence officials and Netanyahu knew within hours of the kidnapping and murder of the three teens that they had been killed. And they knew who the prime suspects were less than a day after the kidnapping was reported. “Knowing that the teens were already dead, the Israeli government even sent the mothers of the abductees to the United Nations’ Human Rights Council to raise international awareness and plead for their boys’ safe return. Then the IDF launched Operation Brother’s Keeper, the most extensive military operation in the West Bank for more than a decade, under the auspices of saving the missing teens whom, again, they knew to be deceased. On June 17, Israel rearrested 50 Palestinian prisoners set free in 2011 as part of the Gilad Shalit prisoner swap with Hamas — a bold provocation that violates its armistice with Hamas. Without cause, the IDF also rounded up a number of clerics, intellectuals and politicians affiliated with or known to be sympathetic toward Hamas. It also raided hundreds of Palestinian sites, including homes, businesses, universities and clinics — in the process pillaging more than $3 million in cash and property, in violation of the Fourth Geneva Convention. Scores of Palestinian civilians were killed in these operations — again, before rockets were fired from Gaza. The misery of the civilian population was compounded by IDF checkpoints and curfews that severely restrict the movement of the Palestinian people, during Ramadan, no less. In mid-June, in preparation for the reprisal attacks from Hamas that the IDF was attempting to provoke, it moved its Iron Dome batteries into southern Israeli cities. Prime Minister Benjamin Netanyahu then called on Palestinian Authority President Mahmoud Abbas to dissolve the unity government with Hamas — reiterating previous threats of punitive measures unless the union is suspended. Meanwhile, the IDF began calling up reserve troops in anticipation of the ground assault. There can be no doubt that the exploitation of an atrocious murder of teenagers, the sociopathic deceit with which their deaths were covered up, the murderous and punitive military operation that was justified on the basis of the false claim, and the false association of blame on Hamas when there was no evidence and furthermore when there was an enormous amount of evidence on the contrary that it indeed was not Hamas, coupled with the incitement of violent, racist anti-Arab sentiments that started at the top with Netanyahu and a number of other high Israeli officials, one being Israeli lawmaker Ayelet Shaked who called for the genocide of the Palestine people, “including its elderly and its women, its cities and its villages, its property and its infrastructure,” as well as calling for the slaughter of Palestinian mothers who give birth to “little snakes,” which trickled down and engulfed a highly indoctrinated and militarized Israeli population into a frenzy of hatred, Ayelet Shaked’s statement on Facebook garnering more than 5 thousands ‘likes’ and more than one thousand shares, the frenzy of which is further illustrated by the joy and euphoria in which members of the Israeli population sat in lawn chairs and cheered the death of Palestinians as they watched the bombs being dropped over their heads from the comfort of their Israeli neighborhoods, the subsequent revenge slaying by Israeli citizens of 16-year-old Muhammad Abu Khdeir, the brutal police beating of his 15-year-old cousin, the Palestinian-American Tareq Abu Khdeir, and the mobs shouting “death to the Arabs,” across Israel prove that even before the first rockets were fired from Hamas, the Israeli government was involved in extreme provocations and direct attacks upon Palestine, including the incitement of racial hatred and violent-frenzy amongst their own population. No true scholar can honestly say that this latest military assault was a result of Hamas attacking Israel; this has absolutely nothing to do with defense. 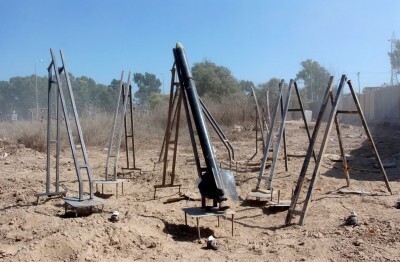 Would the cessation of Hamas rockets be sufficient to halt the current Israeli attacks? 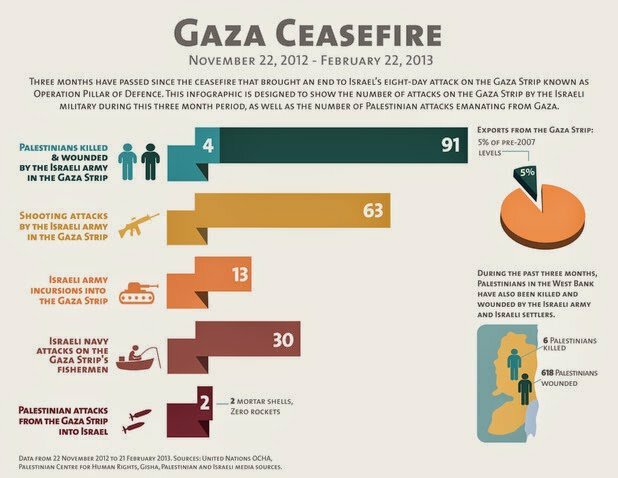 In November of 2012 a ceasefire agreement was brokered between Israel and Hamas that ended Israel’s 8 day military offensive “Operation Pillar of Defense.” After the cease-fire agreement, not one rocket was fired into Israeli territory from Gaza… until Israel broke the ceasefire. As confirmed by Israel’s Ministry of Foreign Affairs, “On the morning of February 26, 2013, a rocket hit was identified south of the Israeli city of Ashqelon. It was the first rocket fired from the Gaza Strip into Israeli territory since November 21, 2012, the end of Operation Pillar of Defense.” What the Ministry of Foreign Affairs does not point out however, is that it was Israel, and not militants from Gaza, who had already broken the ceasefire prior to this attack. Despite the consistent violations and attacks by Israel, as the chart above depicts, Palestinian retaliation has been minimal. The official Israeli Security Agency website states, “2013 saw a sharp decrease in the rate of terror attacks originating in the Gaza Strip, as opposed to 2012: 55 attacks as opposed to 1,130 in 2012.” They note that, “The circumstances that lead to this decrease were the Pillar of Defense ceasefire agreement in late 2012 (14-21 November) which curbed terrorism from the Gaza Strip.” This is due to the fact that Hamas was highly effective at reducing rocket fire from jihadi militants in an effort to abide by the ceasefire, even arresting and jailing those who still fired rockets at Israel; the result was a substantial reduction in rocket fire, none of which came from the Hamas government themselves, despite the widespread violations from Israeli forces. In the current escalation of tensions, as noted before, Israel has engaged in a series of provocations and attacks, which provoked some rocket attacks in Gaza (at least 62 according to Reuters), but none were from Hamas. If Israel had abided by the 2012 ceasefire agreement, and hadn’t sought to turn the tragedy of 3 teenagers abduction and murder into a phony justification to launch on assault on Palestine, the escalation of attacks would have been halted, however Israeli officials were not interested in peace, and were waiting until Hamas launched rockets in order to then announce their military offensive against them. However, despite all of the provocations, none came, until Israel conducted an air strike (one of 80 since the beginning of June) in Gaza on June 29th that killed a Hamas gunman and wounded 2 others. This caused a retaliation a few hours later on June 30th where Hamas launched their first rocket attacks at Israel since 2012. “In other words, Hamas mostly wants Israel to abide by agreements it has already made. Israel rejected the ceasefire proposal, peaceful means to end the hostilities that they themselves had already agreed to back in 2012, and instead launched an air strike on July 6th in Gaza, in which 9 Hamas militants were killed. Hamas responded with an escalation of rocket attacks on July 7th. The next day on July 8th, the Israel Defense Forces launched Operation Protective Edge. This not only constitutes a war crime, it is the greatest war crime of them all, that of unprovoked aggression. At the Nuremberg trials following the Holocaust, the International Military Tribunal said that, “to initiate a war of aggression… is not only an international crime; it is the supreme international crime differing only from other war crimes in that it contains within itself the accumulated evil of the whole.” The military siege on Gaza that began on June 12th in the West Bank with Operation Brother’s Keeper, and the subsequent aggressive assault on Gaza in Operation Protective Edge, were deliberate acts of war, ones that contained no justifiable pretext whatsoever, and therefore “contains within [themselves] the accumulated evil of the whole.” And the “whole” is unfortunately pretty horrendous. These facts run in direct contrast to the accepted mainstream discourse in the West, and the documented historical record of the conflict completely and utterly disprove the Israel and US line that Israel is simply responding in defense to Hamas rockets, and engaging in military campaigns that it is pained to participate in, all in an effort to benevolently protect its citizens from an outside security threat. And honest scholars understand this façade. In conclusion, it is obvious that this current escalation of tensions, in line with the historical record of the previous escalations, are a result of Israel’s aggression and inability to hold to peaceful agreements. In the past Hamas has abided by ceasefire agreements while drastically reducing the occurrence of jihadi rocket launches into Israel from Gaza, while Israel has violated them. Therefore, it follows that if a peaceful negotiation is reached in this current conflict, there would be no guarantee that the cessation of hostilities from Hamas and Gaza would be sufficient to halt another Israeli attack. “The biggest challenge to the cease-fire agreement is persistent Israeli violation and the lack of any accountability for them. The politics of the Gaza Strip are complex. Israel says it wants Hamas to control projectile fire from other factions and yet it persistently violates the truce putting Hamas in a position of having to defend Israel’s violations. By targeting groups other than Hamas and by expecting Hamas to crack down on their responses, Israel is playing a dangerous and deadly game of divide and conquer in Gaza that will likely lead to the unraveling of the cease-fire. Despite all of this, the most important violation of international law that was committed here has been overlooked. Nations do have a right to defend themselves, yes, however only after peaceful means have been exhausted are they allowed to do so. This follows from an elementary understanding of morality and human decency as well as from established international law. So one more elementary question needs to be asked: did Israel exhaust all peaceful means to end the hostilities? Given what has already been discussed, the answer is emphatically no, however it is useful to analyze further what peaceful means are still available. “The pretexts for the [November 2012] assault were also the usual ones. We can put aside the predictable declarations of the perpetrators in Israel and Washington, but even decent people ask what Israel should do when attacked by a barrage of missiles. It’s a fair question, and there are straightforward answers. One response would be to observe international law, which allows the use of force without Security Council authorization in exactly one case: in self-defense after informing the Security Council of an armed attack, until the Council acts (UN Charter, Article 51). Israel understands that well. That is the course it followed at the outbreak of the June 1967 war, but of course Israel’s appeal went nowhere when it was quickly ascertained that it was Israel that had launched the attack. Israel did not follow this course in November, knowing well what would be revealed in a Security Council debate. Another narrow response would be to agree to a truce, as appeared quite possible before the operation was launched on November 14, as often before. In Gaza too a civilized reaction is possible. The US and Israel could end the merciless unremitting assault and open the borders, and provide for reconstruction – and if it were imaginable, reparations for decades of violence and repression. The cease-fire agreement stated that the measures to implement the end of the siege and the targeting of residents in border areas “shall be dealt with after 24 hours from the start of the ceasefire.” There is no sign of steps in this direction. Nor is there any indication of US-Israeli willingness to rescind their policy of separating Gaza from the West Bank in violation of the Oslo Accords, to end the illegal settlement and development programs in the West Bank designed to undermine a political settlement, or in any other way to abandon the rejectionism of the past decades. As to the actual motivations behind the current assault, well, it is in part the usual reasonings that we are familiar with, as Nafeez Ahmed succinctly put it, IDF’s Gaza assault is to control Palestinian gas, avert Israeli energy crisis, amongst the other usual desires of hegemony, control, and suppression of dissenting voices that stand in the way of those aims. 1.) Zeev Maoz, Defending the Holy Land (University of Michigan Press, January 2009), pg. 35.